The British half farthing ( 1/8d) coin, usually simply known as a half farthing, was a unit of currency equaling 1/1,920 of a pound sterling, or one eighth of a penny. It was minted in copper for use in Ceylon, but in 1842 they were declared legal tender in the United Kingdom. Two different obverses were used. Like all British coinage, it bore the portrait of the monarch on the obverse. Before Decimal Day in 1971 there were two hundred and forty pence in one pound sterling. There were four farthings in a penny. Twelve pence made a shilling, and twenty shillings made a pound. Values less than a pound were usually written in terms of shillings and pence, e.g. forty-two pence would be three shillings and six pence (3/6), pronounced "three and six" or "three and sixpence". Values of less than a shilling were simply written in terms of pence, e.g. eight pence would be 8d. A price with a farthing in it would be written like this: (19/11 1/4), pronounced "nineteen and elevenpence farthing". The coin was initially produced in 1828 for use in Ceylon, and again in 1830. The obverse of the coin bears the left-facing portrait of King George IV, with the inscription GEORGIUS IV DEI GRATIA date while the reverse shows a seated Britannia with shield, facing right and holding a trident, with the inscription BRITANNIAR REX FID DEF. There was no indication of its value. The coin was made of copper, weighed 2.4 grams, and had a diameter of 18 millimetres. In 1837, in the reign of King William IV, there was another issue, also of copper, 18 millimetres in diameter, but only weighing 2.3 grams. The obverse of this coin bears the right-facing portrait of William IV with the inscription GULIELMUS IIII DEI GRATIA 1837, and the same reverse as before. In the reign of Queen Victoria, coins were minted for circulation in 1839, 1842, 1843, 1844, 1847, 1851, 1852, 1853, 1854, and 1856. Again they were made of copper, 18 millimetres in diameter, and weighed 2.4 grams (except for 1856, which was 2.3 grams). The design changed considerably from what went before—the obverse bears the left-facing portrait of Queen Victoria, with the inscription VICTORIA D G BRITANNIAR REGINA F D, while the reverse bears a crown above the words HALF FARTHING with (1839) a rose with three leaves at the bottom of the coin, or (1842 and later) a rose, thistle, and shamrock. The change in design was because the coin was additionally made legal tender in the United Kingdom from 13 June 1842. There was much cynicism of the need for such a coin in Britain, with letters written to The Times, but the coin did indeed circulate widely in Britain and Ceylon. The purchasing value of a penny in 1844, at 2013 purchasing power, is (at its lowest) 35p (GB pound sterling). A half-farthing, therefore (one eighth of a penny) would have had a value today (2013) of 4.375p (GB Sterling pence). 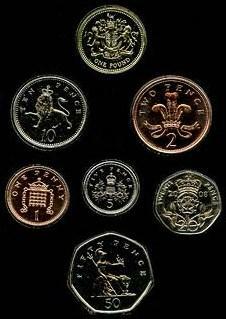 Yet, as of 2014, the UK still has widely circulating coins of just 1p and 2p. The half-farthing therefore was not of so minuscule a value as (middle-class) writers of the day (1844) might imagine. The entire denomination was demonetised from 1 January 1870. ^ "Coin Database". Coin Database. Retrieved 19 May 2014. ^ "Fractional Farthings". Royal Mint Museum. Retrieved 19 May 2014.